WHAT IS THE MARKET CSA AND HOW DOES IT WORK? CSAs (Community Supported Agriculture) are a wonderful way to support local farmers. When you purchase a CSA you get a share in the farm for the season, which translates into fresh local veggies. When you join our CSA program you are making an investment in The Kitchen Garden and local food. Your support gets us off the ground every spring, helping us with seed, equipment and labour expenses. Our model differs from more traditional CSA programs in that rather than a weekly box of pre-packed vegetables, a market share allows members to come to our stall at the Memorial Centre Farmers' Market and choose from our market offerings. The weekly value for the standard share is $25.00 per week. Each pick up week you will be given points to spend at our stall. Our Standard Share is a good size for the average small family, couple or the veggie loving single but it really varies depending on your household. If you need more delicious produce on a given week CSA members are welcome to purchase additional vegetables at a discounted rate. If you are like us and love to eat lots of veggies or have a big family, we have a larger share option, the Grande, which gives you $35.00 per week of vegetables. We strive to make our CSA as flexible as possible. If you can't make it every week during the season, no problem. You can choose our flexible 12 , 16 or 20 week shares packages allowing you to come to market anytime between June 9th and October 27th. You can still go on vacation and not have to miss a share you are paying for! See above right column for pricing. WHEN AND WHERE DO I COLLECT MY SHARE? You can find us every Sunday at the Memorial Centre Farmers' Market from late May until the end of October. We highly recommend CSA members arrive before 11am to ensure ample selection and avoid disappointment. If you are away, a friend or other family member is welcome to pick up your share for you. We just ask you to let them know that they should touch base with us when they arrive at market. Points can not be transferred from week to week. However, you can always double up weeks if you'd like. Pick up is only at our market stall. We can't accommodate on farm pick ups. Signing up is easy! Click on the button below to register and choose your CSA. 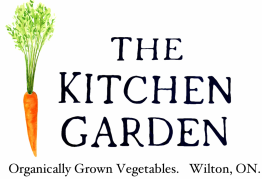 Payment can be by cheque mailed to the farm, email money transfer to info@thekitchengarden.ca or via credit card on our secure form. Please make all checks payable to Evan Quigley. ​Feel free to get in touch. An example of a typical Market Share checklist you would fill out each week.